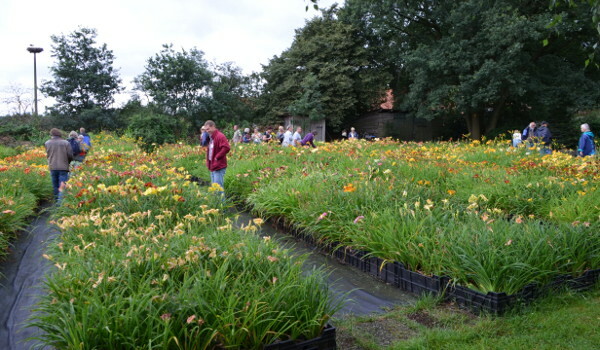 This year the annual meeting of the daylily fans of Hemerocallis Europa (HE) and Hemerocallis Group of GdS (= Gesellschaft der Staudenfreunde) took place in Walsrode. Walsrode was now my second convention and this is already my second conference report. I made my way all the way to the north of Germany because of the garden of Gerald Hohls that I always wanted to see. Although I have visited nine hybridzers in Florida this year, my appetite on daylilies was not yet satisfied. After the departure from sunny Bavaria the cool and wet weather in the north was at first a disappointment. To warm up I first had coffee and cake (homemade cake is still the best!) before I went to the Gerald Hohls daylily garden. The garden was at the rear part of the property and could be accessed through a gated passageway. I felt like Alice in Wonderland as I walked through the passage. Despite the cool weather many of the over 3000 cultivars bloomed, so that there was enough to admire. The area around the patio was designed as a mixed planting with other perennials and shrubs. Huge perennial beds all with daylilies made up the rest of the garden. Part of the blooming daylilies were not completely open, which was for some conference participants an opportunity to bad-mouth all American dayliles. As a lover of newer varieties - about half of my 250 species are from 2005 or later - I was frustrated and close to return home again. From my point of view there were only a few of the newer US cultivars struggling with our climate. But also the local variety "Goldfiligran" (European daylily of the year 2010 and much admired in my garden) this year opened sometimes incomplete. It is only natural that a daylily in our cold summer can sometimes get off cadence. In the subsequent HE meeting the election of a new president was impending. Jamie Vande was unanimously elected and presented us with his ideas of how to bring HE back on track in the future. I look forward to a more modern and intensive communication. This year the Waterman Award winner is "Rock Solid" (Trimmer, 2002). Afterwards we could then relax with grilled meats and salad, which was provided by some voluntary helpers. The next highlight in the program was the auction of plants for the benefit of the two clubs. Also this time, I could not comprehend the criteria why for some daylilies much money is offered, and not for others. But it does not matter, as the entertainment value was great: Georg von Koppen led the auction in an easy and funny manner and made sure that the attendees actively engaged. Through the auction the two clubs attained € 1,624. Unfortunately, most people left after the auction. Only a few stayed longer. 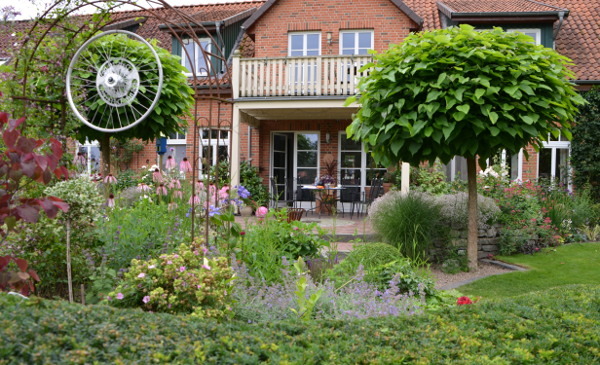 Early next morning it was time to drive to the garden of Helga Mischer in Emmendorf by bus. This day we were lucky with the weather. After a cool night, we expected a warm and sunny day. When we left the bus we were in a normal house settlement. Only behind the house, we came across a large natural garden directly at the Ilmenau creek. The over 700 daylilies were harmoniously integrated into a large perennial planting. 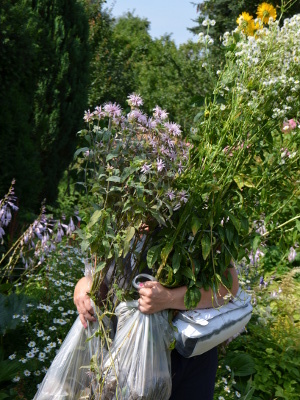 The selection of companion perennials suggested a long flowering period during the year. 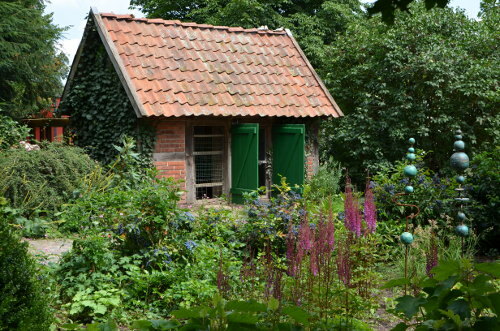 I can well imagine to spend a day in Helga's garden and just daydream. Many attendees took the opportunity to dig a few beautiful or rare perennials for little money. By bus we went on to the perennial nursery "Pure nature". Here we were able to enjoy a meal, indulge in shopping or just stroll in the nursery and show gardens. These show gardens consisted of a tree park, house gardens, country gardens and a grove park. Many attendees availed themselfes of the opportunity to shop for plants. 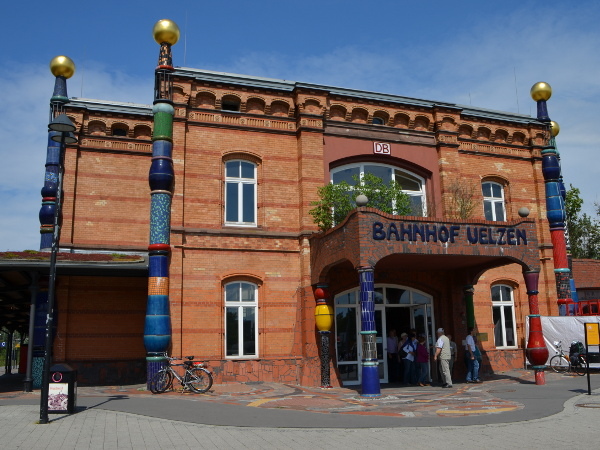 We continued our trip and visited the Hundertwasser railway station in Uelzen. During the guided tour we learned that Friedensreich Hundertwasser created a building renovation for but a single building of any specific building type. Uelzen is his railroad station! Therefore, the modification of this railway station is unique. You can be of two minds about Hundertwasser, who celebrated an intense use of colors, but the idea that there are no straight lines in nature, is convincing. Also the way he encouraged the craftsmen to show creativity is impressive. The trip back to the hotel was a great opportunity to make up for lack of sleep last night. A few of us used the remaining time before dinner to take a few pictures in the garden of Gerald Hohls. Nobody knew how the weather would look like on the next day. 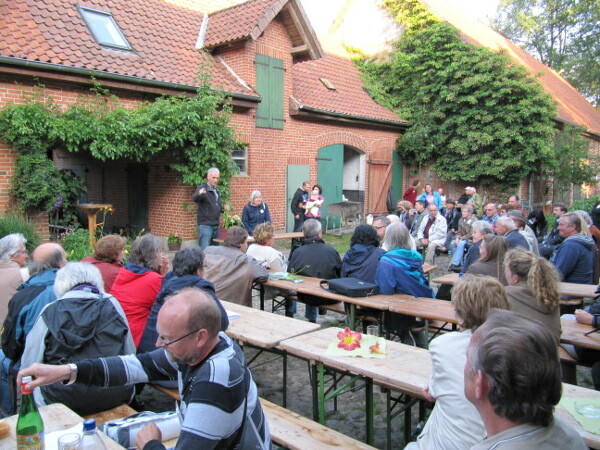 After the buffet dinner in the restaurant "Anders" we went to the public meeting of GdS, Hemerocallis group. After much wrangling, Dr. Bernhard Krismer was elected the new chairman. 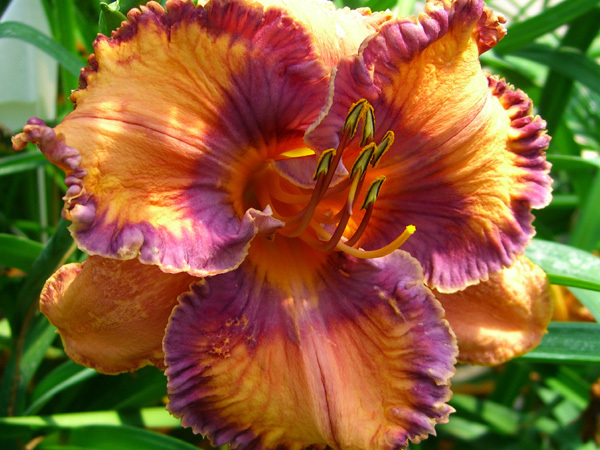 In the second part of the meeting some members showed many beautiful pictures of daylilies and seedlings. The meeting was concluded by a scientifically detailed presentation on the perennial planting on the island of Mainau, which was created in cooperation by GdS and the University of Kassel, Department of landscaping / vegetation technology. I think all the pictures were shown that were ever taken of the plantation. However, what I have learned is that you should not use the spectacular daylily cultivars for integration in a perennial planting because they would dominate with their flowers, as they are too eyecatching. 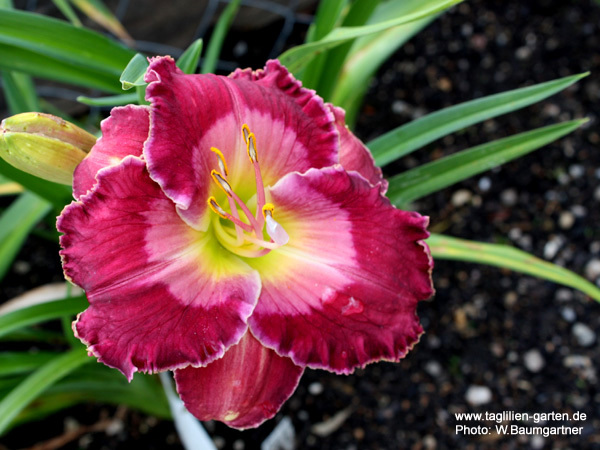 Single-colored and less contrasting daylilies should be preferred. Unfortunately, it was rainy on the next day. In your own cars we went to the perennials nursery of Rolf Offenthal in Grethem. Such a small nursery would be my dream if I had to quit the computer industry. 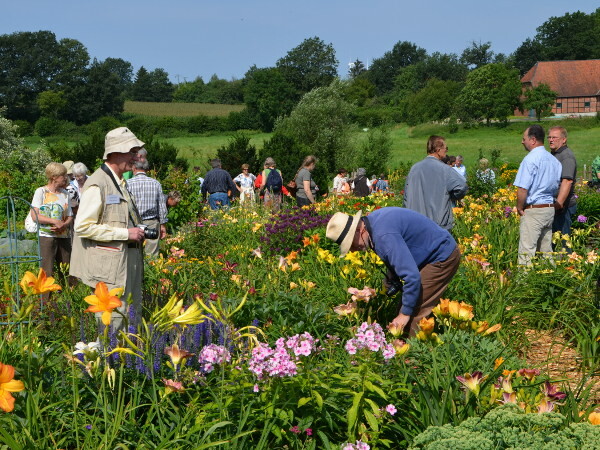 Many took the opportunity in this nursery to enlarge their collection of perennials and daylilies. I did not attend the photo session at the garden of Gerald Hohls which was next on the agenda because I had a long way home before me. 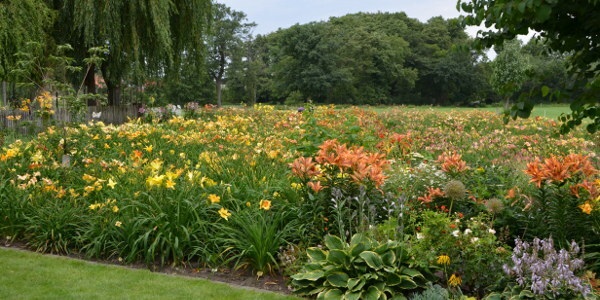 I was impressed by the enormous diversity of daylilies in the garden of Gerald Hohls as well as the felicitous combination of perennials in the garden of Helga Mischer. However, even more important for me during those two days was to see old friends from my last meeting and to make new contacts. 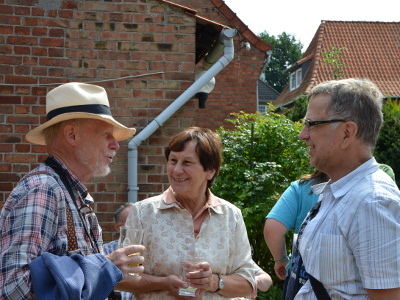 I enjoyed the relaxed atmosphere and the openness of my fellow hybridizers and enjoyed the many in-depth discussions. I'm looking forward to the next meeting and to making new friends.